It took eight telescopes and more than 200 astronomers to produce an astonishing, never-before-seen image of a distant black hole. Orange you glad you've just seen the first-ever image of a black hole? Today (April 10), a global collaboration of more than 200 astronomers presented the first image of a directly-observed black hole. The picture of a glowing orange-yellow ring around a dark core, was compiled from observations by eight ground-based radio telescopes known collectively as the Event Horizon Telescope (EHT). 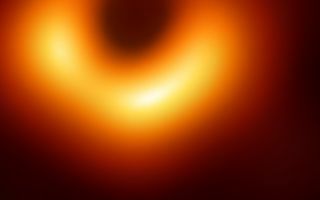 Though black holes are compact objects, they are exceptionally massive — the mass of M87's black hole is about 6.5 billion times that of our sun, the National Science Foundation (NSF) said in a statement. Because of this enormous mass, black holes warp spacetime, heating the dust and gas around them to extreme temperatures, according to NSF. By definition, black holes are invisible, because no light escapes from them. But a prediction made by Albert Einstein in his theory of general relativity stated that under certain circumstances, an outline of a black hole and its light-swallowing event horizon could be seen, according to representatives of the Haystack Observatory at MIT, which houses one of the EHT telescopes. "If immersed in a bright region, like a disc of glowing gas, we expect a black hole to create a dark region similar to a shadow," EHT Science Council chair Heino Falcke, a professor of radio astronomy and astroparticle physics at Radboud University in the Netherlands, said in the NSF statement. This is the first-ever image of a black hole. The black hole in M87 isn't the closest to Earth, but it's among the biggest, which made it a very promising target for the EHT, Derek Fox, an associate professor in the Department of Astronomy and Astrophysics at Penn State University, told Live Science (Fox was not affiliated with the EHT discovery). In the image, the dark circle represents the "shadow" of the black hole and its boundary, created by the glowing material that surrounds it. However, the colors of the bright ring in the image aren't the actual hues of the gas; rather, they represent a color map chosen by EHT researchers to depict the brightness of the emissions, Fox explained. "The yellow is the most intense emission, the red is less intense, and then black is little or no emission at all," Fox said. In the optical range, the ring around the black hole would likely appear white, perhaps tinged with blue or red, according to Fox. "I'd expect it to be more of a whitish glow that is brighter along the crescent, dimmer at the other points, and then black where the black hole is casting its shadow," he said.